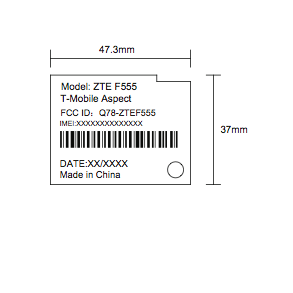 Enter the T-Mobile Aspect, a ZTE-manufacturered device just discovered passing through the hallowed halls of the FCC under the name ZTE F555. As the device appears to only have AWS/1900 on board for 3G/4G access, we’re pretty sure we’re looking at a feature phone, not a smartphone. For the most part, since the end of 2011, T-Mobile’s smartphones have featured at least 850/AWS/1900 on board and as this ZTE device doesn’t seem to go in that direction, we’re likely looking at something in the feature phone category. Of course, we’re just hypothesizing for now and we could be completely surprised as more details arrive, but I wouldn’t be too surprised if this landed on the Monthly4G shelves. With the details under wraps, we’re still just speculating, as the filing on June 29th requested a confidentiality period of 180 days. That timeframe almost never lasts without something leaking out from somewhere, but I’d keep hopes to a minimum for this to be anything other than a feature phone. Still, we’re always up for surprises! plus basic phone upgrade order. unauthorized upgrade & tmo reps wouldn’t fix this! I’ve seen a few people post complaints on TMo’s FB page and get pretty quick responses with some direction on who to contact…and a lot of people will see your post. You need to complain to T-Mobile. This is not a T-Mobile site. It is a blog. You cannot be helped here because no one is authorized to help you here. You can write to Tm c.s dept via cert.mail,just made sure it to head of c.s. Doesn’t matter if you know the name of the person who charge of c.s.,just be sure it is to the head of c.s,return receipt. You should get letter back from them very shorty from them. Just give them as many details as you can,outlining what happen if retention doesn’t help you. That what I did,I got answer back from them very quickly. Hope’s this help’s. I bet it is a Data stick or a hotspot too. They have never made a handset for us. It would be very odd for a data stick or a hotspot to not have all the frequency bands. The Sonic 4G hotspot has UMTS 850/AWS/1900/2100, as does the Rocket 3.0 data stick. However, I suppose it is possible if it is a low end cheap stick/hotspot to replace the older ZTE MF61 and the Rocket 2.0. That said, there are other ZTE Fxxx featurephones out there. The ZTE F160 was an AT&T candybar featurephone that had GSM and WCDMA support. There was even a WCDMA 850/AWS version of it, for some reason.